Marriage Indexing: Signatures! Look for them! When clerks filled out a marriage license form, they spelled the bride and groom's names the way they thought they were spelled. The bride or groom, however, when they signed the license application, used the spelling they were used to using. Which one do you think is more likely to show the correct name? Please look for signatures of the bride and/or groom and use the spelling they used if it is at all readable! HOPPER—Seeking help getting over my brick wall regarding the parents of James R. HOPPER (variations in spelling of last name are possible), who was born about 1831 in Indiana. He was probably from either Greene County or Orange County. He married Mary Frances ODELL (born about 1837 in Indiana) on 7 September 1853 in Greene County, Indiana. She was the daughter of Isaac Odell and Elizabeth LAMB. James and Mary moved to Ash Grove Township, Shelby County, Illinois in 1855 and were there for the 1860 census, then were in the 1870 and 1880 censuses in Cumberland County, Illinois. They had 11 children, all of whom were born in Illinois. Mary’s retarded sister, Lucinda Odell (born about 1850 in Indiana), lived with them in the 1870 census. 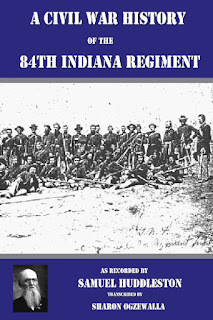 Sharon Ogzewalla has transcribed a series of articles her great-great-grandfather, Samuel Huddleston, wrote for a Henry County newspaper in 1871 about his service in the 84th Indiana Regiment. The articles were the result of a journal Huddleston kept during the Civil War and include information on the battles the regiment fought, as well as the names of the men who were wounded or killed. Information on the men of Company C, which Huddleston served in, is also included. Samuel Huddleston was a nephew of John Huddleston, whose home in Cambridge City, Indiana is now a historic landmark. ONE QUARTER OF A MILLION RECORDS! Can you believe it? And in less that six months. This bunch of genealogists have finally put the word awesome back in my vocabulary (teenagers took it out with its overuse). A common purpose and a handful of willing people and it is amazing what can be accomplished. SKINNER/BURTON—Looking for information about the families of Barnett SKINNER (born 1810-1820; died 1840-1850) and Rebecca BURTON (born about 1809; died after 1850). They were married 5 October 1832 in Decatur County, Indiana. Rebecca is the head of household in the 1850 census for Decatur County, living in Adams Township. Some of their children also lived in Sand Creek Township and Washington Township. There is also a George Skinner who married Sally Burton on 23 September 1834 in Decatur County—how are they related to Barnett Skinner and Rebecca Burton? Where are Barnett and Rebecca Skinner buried? Congratulations to Curt Witcher of the Allen County Public Library! At the National Genealogical Society's recent Conference in the States in Richmond, Virginia, Curt was awarded the Filby Prize. The award, which was created in 1999, was named after the late P. William Filby and is given to a librarian who has made "significant contributions to the field of genealogy and local history." It includes a $1,000 prize. Curt is a former president of the National Genealogical Society and the Federation of Genealogical Societies. 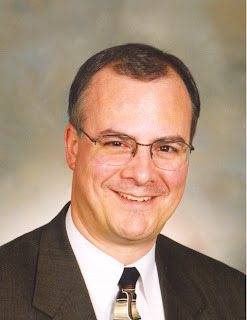 He is also the founding president of the Indiana Genealogical Society and was named a Fellow of IGS in 2006 in recognition of his continuing efforts. DAY--George DAY (born about 1813 in Kentucky) and Elizabeth WHITE (born 1828 in Ohio; died April 1887) were married 27 December 1846 in Marion County, Indiana, and their first child, Mary Catherine Day, was born there in 1847. Mary Catherine married William Peter DICKSON on 27 August 1870 in Hendricks County, Indiana. Her parents first appear in Hendricks County in the 1860 census, living in Eel River Township. --John W. Day (born 1852)—not found again as John; however, a William with similar birth year becomes an often referenced Day within family connections. He married Perlie DICKS in 1889 and I believe a Myrtle YANCY in 1897. --Robert E. Day (born March 1855)--married Sarah Ann TUCKER on 18 January 1882 in Hendricks County. --George Washington Day (born 1854)--married Paralee Tucker on 1 October 1885 in Hendricks County. --Drucille Olive Day (born 1857)—married Charles R.L. MERRILL on 2 March 1879 in Hendricks County. --Morton M. Day (born about 1866)--moved to Portland, Oregon where he married and had 4 sons and died. Elizabeth Day died a tragic death when her clothing caught fire while making soap. George was a farmer but no land or tax records have been found. I have information regarding Mary Catherine Day and the Dickson family but am seeking information about any of the Days. MAXWELL--William MAXWELL (born July 1778; died April 1841 in Henry County, Indiana) and wife Mary came from New Jersey to Henry County, Indiana, before 1828. A son, Aaron (born in 1796 in New Jersey), and his wife, Elizabeth (born in 1798), also came to Henry County before 1826. Other children may also have come, as there is another Maxwell in the county about the same time. --Robert D.--married Mary J. SHINN on 9 October 1856 in Henry County and had two sons, Henry M. and Charles M., before he died in 1860. William, Aaron and William H. Maxwell all had land in Henry County and were farmers. Aaron was described as the "first businessman" in a small community in the southwest corner of the county. Most of the children and known grandchildren are buried in the Knightstown Cemetery. I have information regarding Eliza Jane Maxwell and the Tyer family but am seeking information about any of the Maxwells. The Genealogical Society of Marion County (http://www.rootsweb.com/~ingsmc/) is having a special sale until June 30 on a couple of their historical atlases. The Atlas of Indianapolis and Marion County Indiana 1899 (13" x 11"; hardbound; regularly priced at $32) and the Marion County 1855 Wall Map Atlas (14" x 11"; softbound; regularly priced at $12) are available together for just $35--a price which includes shipping & handling (note: Indiana residents must add $2.10 to their order for sales tax). Make checks payable to Genealogical Society of Marion County and mail to: Genealogical Society of Marion County, P.O. Box 2292, Indianapolis IN 46206. Some of the Decatur County information for a license and/or marriage is not always on just one image. The license might be on the first image and a couple of images later, you find the marriage information. DO NOT try to pair these up. Index each as though it were a separate record, recording what is there and marking as blank (Ctrl+B) any fields that have missing information. When you get to the second image, do the same thing -- index what is there and mark as blank (Ctrl+B) the fields for the missing information. Even though you should set the number of records per image as you begin each batch, watch out of the oddball image that will have more or less than what you thought. For example, you may set the number of records per image as 4 for a batch and then later find one of the images contains 5 records rather than 4. In the middle of your screen, there are icons that let you add a record for one image or delete a record for just one image. Make yourself familiar with those icons and I think you'll find them useful. William and Emma Blue were living in Indianapolis in the 1900 and 1910 censuses (residing at 1329 Cornell Ave. and 542 Tennessee Ave., respectively), then moved to Delaware Township, Hamilton County, Indiana for the 1920 and 1930 censuses, where he was a farmer. --Monta V. (born about 1867 in Indiana)—married Herman RETHWISCH on 7 November 1889 in Bartholomew County. --Edward E. (born about 1870 in Indiana)—married Cassie B. ARMSTRONG on 7 December 1892 in Kankakee County, Illinois. --Luella M. (born about 1872 in Indiana)—married Robert H. GIBSON on 19 January 1889 in Bartholomew County. John R. Bratten may have remarried after Iva’s death. I would also like to find out more about his children—I only know about his son Edward E.
As the IGS At Large District Director, I sincerely hope that your interest in Indiana records will produce a pleasant research experience on your journey to build your family pedigree. Indiana courthouses, libraries, and archives hold a vast amount of information essential to genealogy. It is the responsibility of the researcher, however, to take time to learn about ALL types of records and the important information that each might contain. If you have not already done so, you might want to read the articles on the Research section of the IGS website (http://www.indgensoc.org/research.html). We can all learn something everyday. I know that I do, and I have been researching for 40 years! There are basics that are essential to learn before attempting to do any research. These basics will enable you to understand the research process and fully utilize records available to you. Many wonderful primary records are available on the Internet, but most probate, deeds, and court case files will NEVER be online. The family trees, message boards and forums can provide clues to investigate, but you should never believe what they say until you find evidence to support the content. One misidentification can cause you to waste years researching the wrong people. Finding others who are doing actual research on your families can be a very rewarding experience, but just accepting undocumented information as fact can be disastrous to your project. If you are relying on information without evidence, then now is the time for you to go to the records of your parents, grandparents, and on back, and gather their vital records, census from 1930 and before, plus other records such as probate, deeds and court case files that prove parent-to-child relationships. It is very easy to make misidentifications. Always keep in mind that even official records often contain errors. That is why information should be gathered from multiple sources and then evaluated. If your genealogy is important to you, then you will want it to be accurate. If you have done your work well thus far, you've realized that no other person can do your research as effectively as you. Recognizing the names of your ancestor's extended family and associates can lead you to needed information. If you are unable to travel to the Indiana counties where your interests lie, then contact people on the IGS Researchers List (http://www.indgensoc.org/research/researcherslist.pdf) who are listed for those counties, or listed for nearby counties, to see if they can help you. Their experience level and rates will vary, so be sure to inquire. Also, the Indiana County Genealogists (http://www.indgensoc.org/ICG.html) or local librarians (http://www.indgensoc.org/counties.html) may be able to direct you to appropriate sources. In case you missed it, an article I wrote about courthouse research that appeared in the September 2006 issue of Indiana Genealogist might be helpful. Check at your local library for a copy of the issue. I hope many of you will be coming to Indiana in August for the FGS Conference in Fort Wayne where you can learn more about our Indiana records and also good research techniques that apply anywhere you are researching. Please introduce yourself if you see me. The Indiana Genealogical Society has appointed Connie Brubaker as the Indiana County Genealogist (ICG) for Wells County. A Uniondale resident, Connie has lived in the county over 50 years and been involved with the Wells County Genealogy Society (http://www.rootsweb.com/~inwells/society.html) since 1992. Their former Vice-President and newsletter editor, she has been President since 1999. She’s leading them through their current project—an every-name index of Wells County deeds 1837-1900. Connie has personally compiled several publications about the county, including estray records 1837-1877, an assessor’s book, tax records and information on the locations of all the cemeteries. She is working on a history of Uniondale. She has visited and personally indexed over a dozen cemeteries, and has led several cemetery restoration workshops with stone expert Mark Davis. Connie is also Vice-President of the Wells County Historical Society (http://www.wchs-museum.org) and is curator of the Wells County Museum, where she is in charge of their exhibits and event planning. Some batches you might be getting now are NOT LICENSES and NOT MARRIAGES. They are permission affidavits. Please read what it says and if there is nothing to say that a license was issued or that a marriage took place, index only the bride and the groom's name, the County, and the year the record was created. DO NOT fill in any other information. If you cannot identify what the document is, please return the batch rather than indexing a lot of information that an arbitrator will have to remove. Or if you have questions, get in touch with me at indexing@indgensoc.org. The Wabash County Genealogical Society (http://www.rootsweb.com/~inwcgs/) is now accepting pre-publication orders for its reprinting of the 1894 Wabash County directory (published by Trusler & Parmenter), which totals 254 pages. The pre-publication price is $12 + $6 shipping & handling (after July 1, the price goes up to $15). Marriage Indexing: Index Like You Read A Book! Each image is a picture of a book and like a book there is a page on the left and another on the right. Please index in exactly the same order you would use for reading two pages of a book. Start at the top left and read/index to the bottom of that page before moving on to the top of the right hand page. Index/read down the right hand page to the bottom and then you are ready to move on the next pages/image. Marriage Indexing: 200,000 and Climbing! You did it! 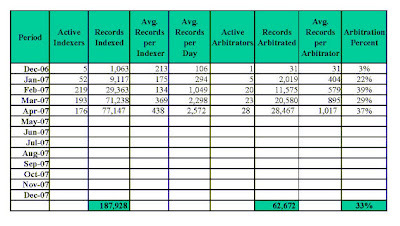 We are over 200,000 records indexed and thanks to all our arbitrators -- old and new -- our percentage of records arbitrated in now 44%! That is more than fantastic! This summer will see this group hitting the half million mark in records indexed, I'd be willing to bet. I'll keep you posted and when we get close we'll see who can pick the day we hit that magic mark! Thanks to all the Indiana marriage indexers and arbitrators for making the project a terrific success! We really couldn't do it without each and everyone of you!!!!!!! The Wabash Valley Genealogy Society (http://www.inwvgs.org) has formed a computer users group to discuss the genealogy software Legacy 6.0 (by Millennia Corporation). This group meets the 4th Wednesday of the month from 2 to 4 pm in the Computer Lab of the Vigo County Public Library (http://www.vigo.lib.in.us) in Terre Haute. Upcoming meetings will be May 23 and June 27. If you have a particular interest in something or someone related to Franklin County, you are invited to submit your program idea and be a possible presenter. For more information, contact julie@wvcl.org or phone (765) 647-4031. The Marion Public Library (http://www.marion.lib.in.us) in northeast Indiana will be the site of this year's GenFest on June 8-9, 2007. GenFest began at a picnic for genealogists in Delaware County, Indiana about four years ago as a way for people to devote a couple of days to genealogy and to share knowledge. It was soon expanded to a regional event. This year's events will include: a barbecue; extended hours for researchers at the Marion Public Library on Friday, June 8; and genealogy exhibitors, as well as demonstrations of the Indiana Marriage Indexing Project software by Shirley Richison Fields. All events are free, and there will be a food vendor on site to purchase food from. Peggy Barnes Fox, former director of the Confederate Research Center in Hillsboro, Texas, recently began a research consulting service. She has 26 years experience in researching Civil War ancestors and specializes in Confederate research. Contact her with any questions or problems--peggyfox1861@sbcglobal.net or phone (254) 582-8127. Marriage Indexing: Don't add info that isn't there! Please do not add information, such as "Indiana" if it isn't indicated on the record. If it just says a county name, then that is ALL you are supposed to enter. I'm getting reports that some indexer(s) are adding Indiana to the county name even when it is not indicated on the record itself. Also, please pay attention to the Auto Complete feature of the program. If you type "A" for the month, you'll get April since alphabetically it comes before August. The same holds true for March and May. If you're dealing with a name and you just typed "Charlotte" on a previous record and now you enter a name of "William C" you are quite likely to end up with "William Charlotte" as the man's name! Check your menu bar and turn off the Auto Complete feature if it is giving you trouble. If you leave it on, please pay attention to what is being filled in for you by the program. Thanks! And know that we are fast approaching 200,000 records indexed--probably within the next few days! 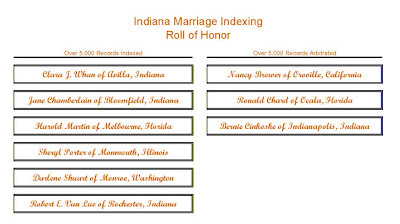 Congratulations to ALL the volunteers on the Indiana Marriage Indexing Project for their efforts! Over 187,000 marriage records have been indexed as of the end of April! GOLDSMITH—Looking for information on the family of my great-great-grandmother, Mary Jane GOLDSMITH (born about 1800 in Harrison County, Indiana). She married David SHIELDS (born about 1800 in Fulton County, Illinois) on August 24, 1826 in Harrison County, Indiana. They had a son named Samuel Heizer Shields—is HEIZER/HIZER a family name? I believe they also had a daughter named Naomi. All I know about Mary Jane’s family was that her father was named Samuel Goldsmith. Is the Samuel Goldsmith who married Lydia BOOKER on October 31, 1835 in Harrison County any relation? If anyone has any information on this family, I would appreciate it. ROUSE/THRELKELD--Searching for descendants of George J. ROUSE (born about 1841-1843 in Indiana; died after 1870) who married Amanda McMULLEN (born about 1841 in Indiana; died after 1880) on 18 February 1863 in Indianapolis, Marion County, Indiana. They were in the 1870 census in Aroma, Kankakee County, Illinois, with daughters Julia (born about 1866 in Illinois) and Etie (born about 1869 in Illinois). Amanda Rouse remarried to Edmund C. MARINE/MERINE (born about 1832 in Indiana; died after 1880) on 25 October 1877 in Kankakee County, Illinois and they are in the 1880 census in Howard County, Nebraska, with daughters Julia (born about 1865 in Illinois) and Luella (born about 1875 in Illinois). --Hiram J. “Jack” Rouse (born about 1834 in Indiana; died after 1870)—married Phoebe ARTHUR (born about 1838-1844 in Ohio) on 1 January 1861 in Indianapolis, Marion County, Indiana. --Louis Napoleon Rouse (born about 1838 in Indiana)--married 1) Hannah PITCHER (his first cousin) on 8 January 1859 in Edgar County, Illinois; 2) Mrs. Mary Ann (HANCOCK) BILYARD on 19 August 1891 in Kankakee County, Illinois. --Elizabeth Kesiah Rouse (born about 1842 in Indiana; died after 1873)—married Thomas THRELKELD on 11 October 1861 in Indianapolis, Marion County, Indiana. Joel Rouse married Sarah PITCHER (died 1847) and she was the mother of his first five children. He then married Mary J. FLINT (born about 1831 in Indiana; died after 1880) on 8 February 1849 in Marion County, Indiana. They are in the 1850 census in Sugar Creek Township, Hancock County, Indiana, then moved to Franklin Township, Marion County for the 1860 census. In the 1870 and 1880 censuses, they are in Rockville, Kankakee County, Illinois. I am also interested in finding the descendants of Elizabeth (Rouse) Threlkeld—she was living with her brother Hiram Jack Rouse in the 1870 census in Indianapolis as well as an 1873 city directory for Indianapolis. What happened to their brother Harrison T. Rouse? WINSTON—Patrick WINSTON (born about 1833 in Ireland) applied for a marriage license in Boone County, Indiana on March 17, 1857. His intended bride was named either Mary S. KOLLARD or Mary SCOLLARD (born about 1839 in Ireland). I've not been able to find a return of the marriage license, and Catholic churches in the area have no record of the marriage. They were in the 1860 census in Dixon County, Nebraska, near the household of John SCOLLARD (born about 1837 in County Kerry, Ireland). Any information on Patrick and his family would be appreciated, especially proof of his marriage to Mary, or son Albert's birth or baptism record. ARTHUR/ROUSE--Searching for information on the family of Phoebe ARTHUR (born about 1838 in Ohio), who married Hiram Jack ROUSE (born about 1833 in Indiana; son of Joel A. Rouse) on 1 January 1861 in Indianapolis, Marion County, Indiana. Phoebe was in the household of John A. WONNELL (born about 1820 in Ohio) and wife Louisa (born about 1822 in Ohio) and family in the 1860 census in Marion County. Who were Phoebe’s parents? Where was she born in Ohio? The Society of Civil War Families of Indiana inducted their first members at a ceremony during the Indiana Genealogical Society's annual conference on April 28 in Fort Wayne. These new members submitted their applications during the 2006 calendar year. SCWFI evaluators Ron Darrah, Diana Moore, and David Gladding-Vanderipe examined the evidence provided and approved their submissions. During the ceremony, which was held in the theater of the Allen County Public Library, SCWFI members received their membership certificates and society medals. Members of the 19th Indiana Infantry, a Civil War reenactment group (participating in full uniform), assisted in the presentations. A photo session followed the ceremony. The Indiana Genealogical Society is looking for someone to be South Central District Director. The South Central District Director acts as a liaison for Bartholomew, Brown, Clark, Crawford, Floyd, Harrison, Jackson, Lawrence, Monroe, Orange, Scott and Washington counties, relaying the concerns (as well as activities) of genealogists and organizations in the area. The position is part of the IGS board and the district director is expected to attend the quarterly board meetings, which are held on Saturday mornings (usually in central Indiana).